It is an annual event, and this year was perhaps a bit larger than usual. In addition to the ongoing changes and small additions I do as a part of normal house-keeping, I also do rebuilds on sections of the site on an annual, or sometimes semi-annual basis. New contributions from owners sometimes piles up as I go through the process of validating new material offered to me. And some parts of the site start to look a bit dated after a period of time, and just need a refresh. sections of the GT750 Field Guide: new gauge photos, new prototype photos, additional JDM sales material (thank you Mike W.). sections of the Resource pages: the service bulletin material already mentioned, additional indexes in some pages, updated photos. and sections of my Projects pages – mainly in the 1972 GT750 project area as it was getting too big and needed to be sub-divided to make it a bit easier to navigate. I also am in the process of adding an SSL certificate to the site. This will allow encrypted communications between your browser and the site. The only real difference most people will notice (assuming I don’t break it completely !) will be that you will see an HTTPS: cue in the address line of your browser address bar. The main reason is to stop having the site flagged as ‘insecure’ by most of the newer browsers, which started in large part this month. I’m not really doing any e-commerce which would require encryption, but it is a ‘good practice’ to follow in this day and age unfortunately. And finally – I wrote a series of articles about my last build (The Oily Purple) which were accepted for publication by RealClassic magazine in the UK. This is a magazine I have subscribed to for some years now, as I like the style of writing and the self depreciating humour of the various contributors. It tends to not have the breathless ‘was this the best xxxxx machine ever’ sort of article which are all too common elsewhere on the news stand, and which I generally find annoying. 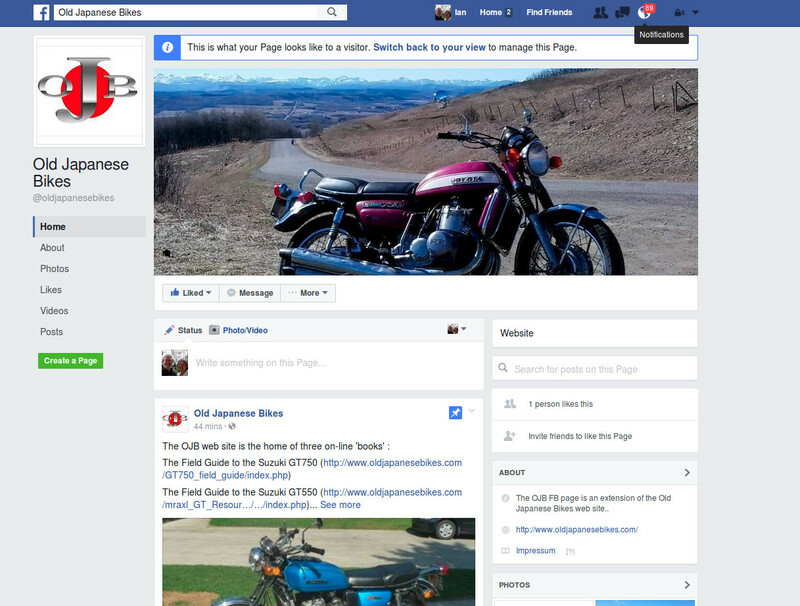 RealClassic tends to feature articles about owning, maintaining and using old (and some not so old) motorcycles. If that sounds like something that would interest you, then you should pick up a copy, and you should especially buy the January, February and March 2017 issues as my articles are in them ! Information about the January 2017 Real Classic issue may be found at this link. I continue to slowly bolt together my current 1972 GT750 project. With a bit of luck I should have the wiring finished this weekend, and then I plan to start building the engine this coming week. You can follow my progress (or lack thereof) at this link ! be said that a drum brake is archaic when compared to a disc, I’m going to go with it ! This article then is about the drum brakes on the 1972 GT750 – and more specifically the front one. 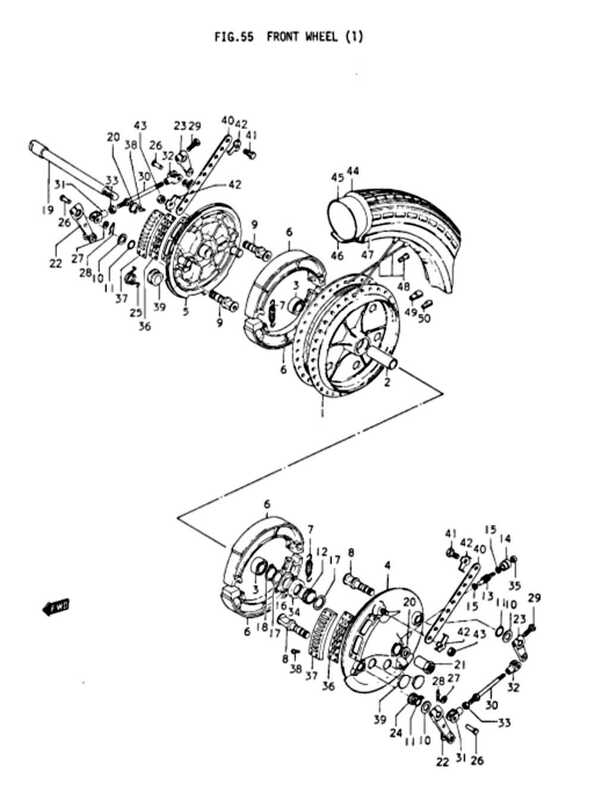 The front drum brake as used on the 1972 GT750 is a twin leading shoe (2ls) drum brake having two brake drums, one on either side of the hub, and four brake shoes in total with each one separately actuated. The idea is that the servo effect of having the 2ls will increase stopping capability – in one direction. Note that when backing a bike off a trailer for example, the brake doesn’t work very well at all in reverse and can lead to unpleasant surprises ! e on the left side were deep enough that I didn’t want to try to polish them out as it may have weakened the flange, but the ding in the edge of the drum (which can be seen in the photo above and to the left) needed to be addressed. Art, who is a friend of mine here in Calgary and who teaches welding at SAIT, managed to do a small repair on the edge that makes it look a lot better as can be seen in the photo on the right. The brake shoe cams are handed, having a slight rounded trailing edge on the edge that lifts the end of the shoe when the arm is actuated. Consequently, you do need to install them on the correct sides. The rear brake cam (which is a conventional drum brake) and mounted on the right side of the drum, is the same part number (54440-11002) as is used on the left hand side on the early, pre-frame number 18325 bikes. The right hand cam (54430-31000) for the front is specific to the 2ls brake as used on the GT550 and the GT750. le in the photo to the left, with the original style on the left and the updated version on the right. Note the rear drum stayed with 54440-11002 which changed to 54440-11003 and was used on many models (T20 rear wheel, T305 rear, all years of T500 front drum brake, and all years of GT750 rear drum brake, plus others). I had most of the steel fasteners and speciality parts re-zinced by Wespen here in Calgary. On the GT750 J (and K and L) there are quite a number of chromed parts which on later models were left in zinc. In some cases the parts cleaned up like new just by having a good soak in Evapo-rust so that is an obvious first thing to try before sending items out to be re-chromed. The air vents (parts 36 and 37) are in two parts with a under grill which I left in zinc, and a top louvred grill which I had re-chromed. The actuator levers cleaned up well enough to re-use as is. There are a lot of parts in these brakes – I’ve included a parts diagram to the right. The lock tabs (part 42) I ordered from Ian Beardsley in the UK who supplies them in stainless steel. You can find them at this link. As previously mentioned, I had Suzuki Canada reactivate the part number for the front brake shoes. I still smile whenever I look at the packaging as I’m not sure why they think they can charge the full price for used shoes (it says they are all factory tested ) but no matter. They work and based on the experience with the Oily Purple I built last year, I have to say they do work better than I had expected. I am still in the process of final assembly. One thing I will need to source are the rubber air vent caps for the side plates. There are five of these (54676-31000) and many of mine have perished from sun and weather damage. I see that Eric of the Knalnaarpotz shop in The Netherlands has these available for about a Euro each. I have bought from him previously and recommend him, but first I will take a look through a couple of local hardware stores to see if they have anything close. Once I have the wheels mounted and a rolling chassis, the next item on the agenda is the engine ! aged whether as a result of ham-fisted cleaning attempts by previous owners, or due to corrosion, and like any mechanical device they inevitably wear out. When these valves start to pass, injector oil drains through the injector pump into the crankshaft area and can potentially cause serious damage to the piston and connecting rods due to the risk of hydraulic lock. As well, leaking valves also will cause excessive smoking when the engine is first started. While all of these old two strokes smoke to some degree, from a ‘good neighbour’ perspective ideally it should be minimised if at all possible. A photo of what they look like disassembled is to the right. Just ‘click’ on the photo to see a larger version. the experiences of others who had bought them seemed mixed. The two together gave me reason to pause, and so more time passed while I continued to splice and or swap good used valve ends for bad ones as per my original article. Then a Sundial member using the name ‘Vintageman’ mentioned in a post that he had used a Kawasaki OEM part 16128-009 which seemed to work for him. Needless to say, I bought a few to try out and am pleased to confirm that indeed they appear to be the same as the original Suzuki part in every respect that matters. While I was not able to accurately measure the crack pressure (the pressure at which the ball lifts from the seat), dimensionally the Kawasaki valves are the same as the Suzuki ones. When fitted into the nylon line, with the metal collar reinstalled they are oil tight and so far at least, they do not seem to leak. ersion. I also have them available for downloading at this link. While as yet I haven’t bought any of David’s valves, I may do so at some point just to compare them. Given his are from the UK, due to exchange rates with the Canadian dollar David’s are a bit on the expensive side, but with a bit of luck the value of the British pound may drop further due to Brexit, making them more affordable for overseas buyers like myself ! In the meantime, I have generally bought mine from Kawasaki in the US where they seem to be readily available and are a reasonable price even after converting from USD to CDN$. Kawasaki here in Canada seem to never have stock on hand, which is annoying, but as with Suzuki here in Canada is all too common. I now have over 2000 miles on a rebuilt set of oil injector lines using the Kawasaki valves which are installed on my 1972 J (called the ‘Oily Purple’ which you can read about here). I am pleased enough with how they have worked that I am now in the process of repairing a few more sets to be used as replacements on other projects I am working on – the next one being another 1972 J model which you can read about at this link. As mentioned previously, the frame had some damage that needed repair, and Jonathan and Derek at Trillion Industries did a great job. The area around the brake pivot post has been completely rebuilt, reinforced and I suppose should now outlast the rest of the frame ! Just ‘click’ on any image to see a larger version. As well the rear shock hanger threads were repaired so all I did then was clean up a few areas in preparation for having the frame and associated bits powder coated. The powder coat was done at Top Gun Coatings in the north east of Calgary and it all came back looking better than new. They bake off all the oil and old paint on the parts in an oven before doing some touch-up sand blasting prior to the actual powder coat and I have to say that the finish they have achieved is excellent. Recommended ! I have the frame on the bench and have started bolting bits back on, checking for fit and seeing what is still missing, what can be repaired or will need to be replaced. I print out copies of the parts manual and go through each sub-component so it isn’t the fastest process, but focusing on the sub assemblies makes the whole project much easier to deal with. see really – I described the engine elsewhere as looking pretty good apart from the bits that were terrible ! The repair work was done by Trillion Industries , and like the frame repairs is excellent – recommended ! The next step for the engine is to have the engine cases and covers vapour blasted (also called liquid honing) by a company in Medicine Hat. This process is pretty common elsewhere, but not in Canada and I’ve only been able to positively identify three companies in Canada that will do the work. It is a glass bead process using high pressure water as the carrier rather than air, and so gives a softer, cleaner finish than can be obtained using just conventional glass bead and air. It will be interesting to see how they look ! Elsewhere, I have some parts back from plating and more to send out, both zinc and chrome, and I have to build some wheels. At least I am unlikely to be bored ! ‘Regal Red’ Rides Again ! With “Oily Purple” on the road and running well, it was time to start work on one of the two sequentially numbered bikes. These are about 3000 frame numbers younger than the purple bike, but share the same early style frame design having the tubing welded into large cast lugs for the engine mounts, the two bolt side stand, no centre cross brace behind the radiator, the welded tubes for mounting the rear signal lights, and the poorly designed combination rear brake pivot/foot peg perch. The xx153 frame seemed to be in better shape, so I decided to start with xx152. This had been poorly repaired in the area of the brake pivot/foot peg mount at some point with blow throughs and loads of weld splatter. The end of the post was badly damaged such that a foot peg would not even fit, but after an hour of careful filing, I did manage to clean it up. Just ‘click’ on any of the photos to see a larger image. As well, the upper rear shock mount threads were stripped and so those would have to be repaired. It is good to know your limitations, and both of these repairs exceeded my skill/comfort level, so after stripping the frame I will cart it off to Trillion Industries here in town where Derek can work his magic. An examination of the rest of what was there yielded a lot of scrap, however the forks, wheels, headstock and a handful of other components looked to be salvageable. In my stash of stock piled bits I had a couple of fuel tanks to choose from, a seat, both front and rear fenders, good side covers. a radiator, the cooling fan, a complete and correct airbox, headlamp with the horseshoe chrome rim, plus several wire harnesses and assorted electrical bits sufficient to get the project done. I assembled a bit of this together as a ‘test’ build and the result does resemble a motorcycle. The next step then was to take it all apart again, remove the engine and do an assessment of what it will need and start to farm out bits for powder coating, chrome and paint. And as well of course , get the frame over to Derek for repair. The other thing I still need to so is to sort through the bolts and fittings I have and see what else needs to be plated. I normally take a couple of coffee cans full of bits in for bright zinc plating, but for this build will also be having some cadmium plating of the spokes done, as well as some nickel or chrome plating of a few of the correct fasteners, as they are difficult to find. I have considered using stainless copies of the originals, but as with all things, cost does start to become an issue. I’m not completely certain this will be a good idea, but I have gone ahead and set up an OJB page on Facebook. You can take a look at it via this link. It is ‘public’ so you don’t actually need a FB account to see the contents, although you will get nagged to login or create an account if you don’t happen to be one of the 1.17 billion active monthly users (as of the second quarter of 2016) already using FB. Here is a screen shot of what it looks like – I plan to leave it up for a month or two and if it proves to be a bother then I can always delete it ! A fellow I know in the UK by the name of Ian Beardsley (an excellent first name by the way 🙂 ) has been making reproduction bits and pieces for the Suzuki GT750 for some time now. I bought a few stainless steel brake tabs for my next rebuild for example, and I was very pleased with them. You can take a look at his web site at this link. ng the airbox, then the old one won’t be there at all ! In the past I have used weather stripping as it is readily available here in Canada (we have long winters), but having something that actually fits as it is supposed to, is definitely a good thing I think. I’ve attached a photo to the right – just ‘click’ to see a larger image. The seal is water jetted from neoprene, and so has a very nice edge and it is self sticking (adhesive backed). The quality is excellent and the price for this sort of thing is reasonable – recommended ! So your turn signal/indicator relay just exited for its place in electronics heaven, and as a result you now have a distinct lack of flash about your machine. You can resort to arm waving, but I suspect most younger drivers in these parts at least would have no idea what you are trying to communicate, so adding the flash part back into the mix seems prudent. Suzuki indicator relays are still available from your friendly neighbourhood Suzuki dealer, but in Canada cost about $75 CDN each ! Cheaper options are available. If such things matter to you, preserving the look of the original part is nice to try and do. The original Suzuki relays are housed in an aluminium can and have the Suzuki part number, specifications and OEM supplier name ink stamped on the end (just click on the image to see a larger version). The end cap having the wire leads comes out easily and there is a yellow wire inside which is secured to the bottom of the can which can just be clipped. This releases the relay mechanism for complete removal. This specific unit is perhaps not the best example as the ground wire on the outside of the relay can is not original – the original wire was soldered to the metal ring that has the tabs on it for holding the end cap in place. The replacement relay is a TRIDON HD12 which is readily available from just about any automotive parts supply place for between $8 and $14 CDN. It is ‘electronic’ in that the flash rate does not change with load. That doesn’t really matter for this application, but is an added bonus I suppose. The key thing is it is a two terminal unit of the correct voltage. The entire new relay unit neatly slides into the old Suzuki relay can, and you then just fold over the securing tabs to secure the new unit in place. The ‘X’ terminal is the power supply (so the orange wire on the old flasher relay) and the ‘L’ terminal goes to the lamp circuit which in this instance would be the light blue wire. You have the choice of soldering the leads, or using a crimped spade connector. Either method works fine, and of course later model GT750 signal relays use spade fittings anyway. The end result looks identical to the original, and is good for another 40 years ! The summer is, yet again, blasting by faster than it has any right to and our safari to eastern Canada is drawing to a close. The main reason for our extended road trip was our younger son’s wedding in Toronto and it was excellent. The ceremony was very well done, the venue was exceptional, the weather cooperated, a good time was had by all, and the bride was lovely. We have known Hana for quite some time and are delighted for our two families to be joined together. The venue was the McLean House on the Sunnybrook Hospital grounds, and I never would have guessed that Sunnybrook offered this sort of thing in addition to all the other services they provide ! My brother Stuart spent months at Sunnybrook many years ago and more recently his son was also treated there. It is quite the facility. The McLean house is at the back of Sunnybrook and was a private home built in 1928 and lived in till 1966 before being taken over by the hospital. The fees charged for functions like weddings support the hospital, so it is a win-win all round. The trip east also provided a plausible excuse for us both to drop in for a visit with our older son and his better half to see their new home ! It is a very comfortable place, in good condition and in a very nice location. And, something only another parent would likely understand I suppose, but it made my heart glad watching him mow his own lawn using his own lawn mower. While we have been travelling I have been busy relocating my web sites to another hosting provider. I was with Netfirms and for the most part I can’t fault the service they provide, however I had started to notice that the site responsiveness had started to degrade during the past year. Added to this was the fact that the Canadian dollar has tanked relative to the US dollar and as all the fees were in USD this was starting to get annoying. The new hosting company I’ve moved to is WHC based here in Canada. So far they have been very helpful and the site management tools they offer are at least as good as the ones offered by Netfirms. Moving the site and this blog provided me with an excuse to refresh a few things, as well as also requiring me to test everything to ensure it still worked so the exercise has been a good one, if not a bit tedious. Time will tell if the move was a mistake or a good idea ! We leave the place we rented on Big Bald Lake in the Kawarthas today for home. As always it is sad to be saying goodbye to the kids, but at the same time we are both looking forward to getting back to our own bed ! And of course SWMBO’d has some quilts waiting to be quilted, while I have some bikes that do need to be ridden ! So I needed a new visor for my helmet, and normally I buy clear ones as they are easy to clean and also relatively cheap. A replacement clear visor to fit my HJC Sy-Max helmet is about $25 CDN. None were available here in Canada to fit the helmet I had, and so as is often the case I had to make a choice: buy a visor I didn’t want, or buy a new helmet. Having to buy a new helmet (a minimum $300 hit to the wallet for the few months of riding pleasure we have here in Alberta) seemed a bit excessive, so I reluctantly went with the $45 option of a mirrored visor. And I have to say that when it arrived and I had installed it I actually liked it ! It added just a hint of grey tint which is useful on a sunny day, and the air of mystery that the mirrored look lent me offered a touch of hipster attitude without having to use 50 feet of bandage on my exhaust system ! There was a down side of course. If you actually ride your bike you will get plastered with splattered bug juice which at some point you will need to clean off, and that is when I discovered a new use for my favourite shop cleaner: ‘Simple Green’. The name says it all ! Safe, effective and environmentally friendly plus it even works which I consider an added bonus. It readily removes splattered bugs from clear visors and I’ve used it for exactly that purpose for years. I was initially somewhat dismayed to learn however, that it also quickly removes the mirror finish from $45 visors ! A blotchy mirrored/somewhat un-mirrored visor is not easy to see through, so what was I to do ? And in a moment of inspiration I had the answer ! After a few minutes work and the application of more of my favourite ‘Simple Green’ cleaner I had managed to convert my oh so cool $45 visor into a more useful, utilitarian and easily cleaned $25 clear visor, which is what I’d actually wanted in the first place.